In print, the Statistical Abstract of the United States is a one-volume, comprehensive summary of statistics on the social, political, and economic organization of the United States. Online it is 1400+ individually indexed tables (with attached spreadsheets), both searchable and browsable. Use the Abstract as a convenient volume for statistical reference, and as a guide to sources of more information both in print and on the Web. 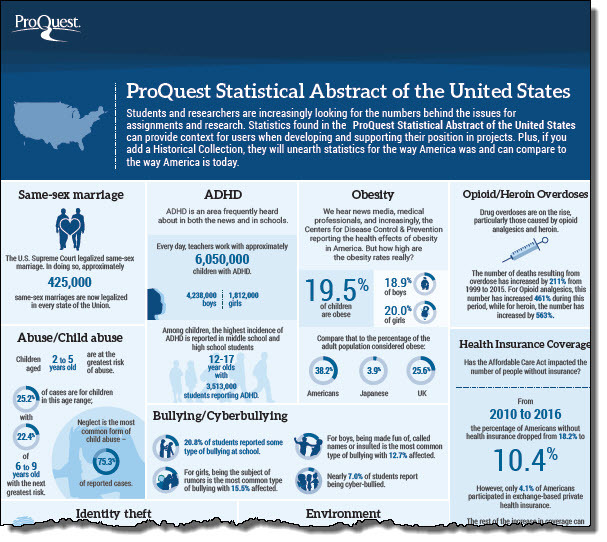 Search the Statistical Abstract of the U.S.
5 Reasons to Use Statistical Abstract of the U.S. The Statistical Abstract is listed under the "History" section in the list.